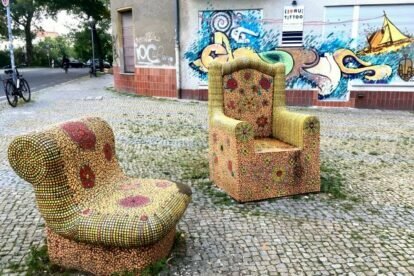 These beautiful mosaic sculptures are only a step away from the S-Bahn station Neukölln. I usually come by here on my way to the Tempelhofer airfield or Hermannstraße, a street full of cafés, kebab stalls, baklava shops and several Turkish supermarkets. If anything, these Mosaic Seats are a very photogenic place to rest your feet. They stand in a small square called “Kirsten-Heisig-Platz” next to a flower bed with a couple of bushes, which is also decorated with red and orange stones. Located in a housing area, it is a quiet place that can be a pleasant break from the hustle and bustle of downtown Neukölln! I am sure that not many people really notice this site, as one would probably only pass it if visiting a specific address in the area. I think this makes it quite special and whenever I happen to pass it, the colourful mosaics always make me a little happier.